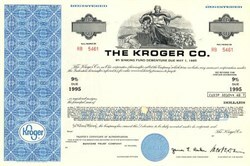 Beautifully engraved unissued certificate from the Kroger Co.. This historic document was printed by the Security-Columbian Banknote Company in 1969 and has an ornate border around it with a vignette of an allegorical woman in a grain field. Punch cancelled. This item has the printed signatures of the company's Chairman ( Jacob E. Davis ) of the Board and Vice President and Treasurer. 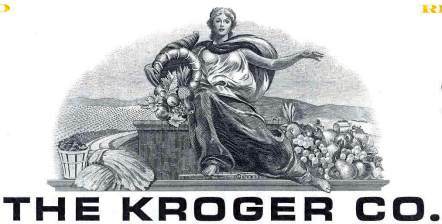 Headquartered in Cincinnati, Ohio, Kroger is one of the nation�s largest retail grocery chains. At the end of fiscal 2001, the Company (either directly or through its subsidiaries) operated 2,418 supermarkets and multi-department stores in 32 states under approximately two dozen banners, including Kroger, Ralphs, Fred Meyer, Food 4 Less, King Soopers, Smith�s, Fry�s and Fry�s Marketplace, Dillon, QFC and City Market. Kroger also operates 789 convenience stores, 427 fine jewelry stores, 227 supermarket fuel centers and 41 food processing plants. In 1999, Kroger merged with Fred Meyer, inc. in a $13 billion deal that created the nations's largest retail grocery company.